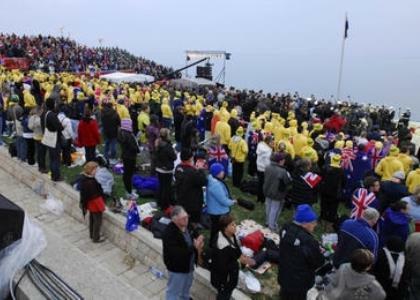 FOR many, attending Anzac Day services at Gallipoli is a once-in-a-lifetime experience. It is both humbling and moving to be present in a place that has played such a critical role in shaping our national identity. Register with www.dva.gov.au/gallipoli — you will be provided with updates and information to make the most of your trip. This site also instructs you on what to bring and not bring with you. Anzac Day marks the date of the first major military action fought by Australian and New Zealand forces during the First World War. They landed at Gallipoli on 25 April 1915, and some 8700 Australians died and a further 19,000 were wounded before the battlefield was evacuated eight months later. New Zealand Memorial Service, Chunuk Bair. The Anzac Commemorative Site usually opens to visitors from 6pm on 24 April. All visitors arrive as part of a tour group. Coaches will drop passengers off about 1km from the site. This will be the last time you’ll see your coach until after the services on 25 April. After passing through the security check point, visitors make their way to the Anzac Commemorative Site. Seating is available in stands or you may sit on the grass. During the night a reflective program is presented including historic documentaries, live interviews and music from the First World War era, performed by musicians from the Australian and New Zealand Defence Forces. After the Dawn Service, visitors make their way up to the Australian memorial at Lone Pine. The walk is around 3km including 1.5km up a steep, winding and uneven dirt road, and is followed by some security screening at Lone Pine. This walk can be difficult for people who are elderly, unfit or have medical conditions. Following the Australian service at 10am, the New Zealand service at Chunuk Bair begins at 12.30pm. After the New Zealand service is finished it’s time to get back on the coaches. It can take a couple of hours to get every visitor back on their coach, but the good humour and patience of visitors makes the time pass quickly. What else is at Anzac Cove in Gallipoli? There are many other areas in the Anzac battlefield that you will be able to visit while you are in Gallipoli.